Every hot selling multimedia device today has enviable specifications, but the first thing the user experiences is the display quality. Displays are coming closer to our natural vision by every passing day, thanks to the increasing resolution, and color depths. 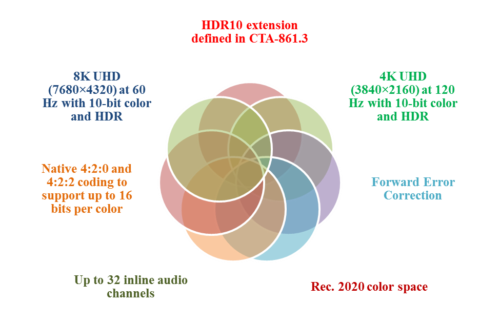 UHD displays with 4k resolution are being adopted rapidly, and demand for even higher 8k UHD displays is also growing. DisplayPort 1.4 features DSC 1.2 (Display Stream Compression) transport, Forward Error Correction, HDR10 extension defined in CTA-861.3, the Rec. 2020 color space, and up to 32 inline audio channels. It features native 4:2:0 and 4:2:2 coding to support up to 16 bits per color; increased compression efficiency increases support of High Dynamic Range (HDR) content, and higher resolutions at higher data rates. DSC uses a visually lossless low-latency algorithm and allows increased resolutions and color depths and reduced power consumption. Using DSC with HBR3 transmission rates, DisplayPort 1.4 can support enhanced resolution of 8K UHD (7680×4320) at 60 Hz with 10-bit color and HDR, or 4K UHD (3840×2160) at 120 Hz with 10-bit color and HDR. Synopsys recently announced the availability of the industry’s first verification IP (VIP) and source code test suite for DisplayPort 1.4 with DSC 1.2 and for eDP 1.4a/b. 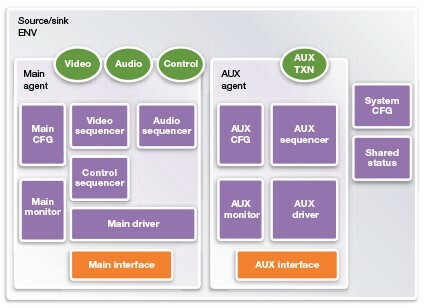 With the increase in consumer demand for enhanced display resolution quality, Synopsys VC VIP for DisplayPort enables system-on-chip (SoC) teams to design these next-generation displays with ease of use and integration, resulting in accelerated verification closure. Synopsys continue to collaborate extensively with standard organizations and actively participate in the development of new protocol specifications at draft stage to release VIP ahead of competition. Availability of first-in-industry customer proven VIP for DP 1.4 with DSC 1.2 will keep our customers ahead of their competitors. Read more on this announcement. For more information on Synopsys’ display and other VIP, please visit: www.synopsys.com/vip. This post is filed under Display, DisplayPort.